On April 26, 2004, I attended the celebration for Candido Camero's 83rd birthday. Produced by Charles Carlini, this event was the 3rd year in a row that a birthday party was held in honor of this elder statesman of percussion. In spite of the horrible rain outside, the Blue Note Jazz Club was packed with adoring fans. 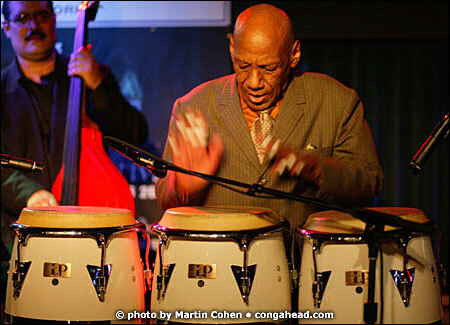 Candido was joined by vocalist, Graciela and conga-legend, Ray Barretto. The band consisted of Sonny Bravo on piano, Ruben Rodriguez on bass, Eddie Parales on flute, Nicky Marrero on timbales and bongo, Nelson Gonzalez on tres, Graciela on vocals.